To register and become a betting client with an online bookmaker provide your full name, date of birth, address, contact details, individual log-in and security details and particulars of your chosen payment method. The online bookmaker will verify a newly registered client. This procedure will be satisfied by an initial check against the electoral role and may also include a request of scanned documentation (ID, utility bill/bank statement/scan of bank card). The procedure aims to verify the clients name, date of birth, address and bank card details. Online bookmakers have an obligation to ensure newly registered clients are above the minimum gambling age of 18 and adhere to anti-money laundering standards. Bookmakers will request an e-mail address together with a phone number for a newly registered client. Via email, bookmakers will, request ID verification, provide withdrawal status, send statements and occasionally send promotional offers. Some bookmakers require customers to follow an e-mail link to complete the sign up process to ensure these details are correct. Phone numbers will only be used for more urgent issues such as if a withdrawal is blocked. Some bookmakers may send out postal communication and marketing material. However, most companies offer a communication opt out facility during the registration process. A newly registered client will be issued a betting account number or asked to choose a username. The username should be something that is easy to remember and that is specific to the customer. A betting account password will also be required and should ideally combine letters and numbers (some bookmakers will specify a minimum length of 6 or 8 characters). Image 1 shows an example of a bookmkaer login window. Security questions are also utilised (e.g. mother’s maiden name, favourite sports team) and may be requested if log in details or passwords are forgotten. 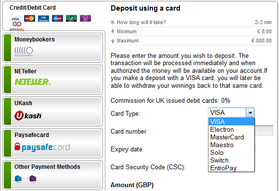 Bookmakers will offer a range of payment methods with which customers may credit their betting accounts, an example of the card details requested is shown in Image 2. When an account is credited a payment sum is taken and converted into an available betting balance. This balance can then be bet with and withdrawn. Customer payment methods will simply show betting deposits (payments from the customer to the bookmaker), and betting withdrawals (payments from the bookmaker back to the customer), not every single bet that is made. The betting balance can be bet in parts, or in its entirety, bookmakers will not extend credit or allow bet stakes above the remaining balance, with the exception of some spread betting companies who may allow a maximum liability greater than the balance. When depositing, provided details are correct; and there is available cash in the payment method; the payment will be processed with funds available to bet immediately. Customers need to be aware that withdrawals can take between 2 and 5 working days to process back to the payment method. This is particularly important where a client intends to make a withdrawal over a weekend. The most common payment methods are debit cards with the process identical to an online purchase for clothes or travel tickets. 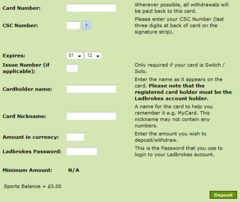 To register a payment the debit card number, expiry date, start date, issue number and name on card must be provided. At the point of payment/deposit the 3 digit number on the security strip will be requested by an external site with many banks then requesting a VISA secure online password to confirm the transaction. Bookmakers should not request the 3 digit security number at any other point and it should be covered if a scan of the card is requested. The payment card needs to be registered to the given address in order for payment to go through. Credit cards can be used, although subject to a small transaction fee. Restrictions on Mastercard use may affect withdrawals being paid back to the card. A debit card registered alongside can overcome this formality. Other accepted methods of payment include Neteller, Moneybookers and Western Union however such methods may be exempt from bonus and free bet offers. Image 3 shows the range of depsoit methods offerred by a typical online bookmaker. As depositing and withdrawing from bookmakers are set individual payments there is no implication on customer’s credit rating. Bookmakers often have a call centre to take customer queries as well as an e-mail address or online e-mail submission form. For security, existing customers will be asked to verify answers to identification and security questions before discussing their account. Some bookmakers will also offer a live chat function on their website to quickly resolve issues during trading hours.